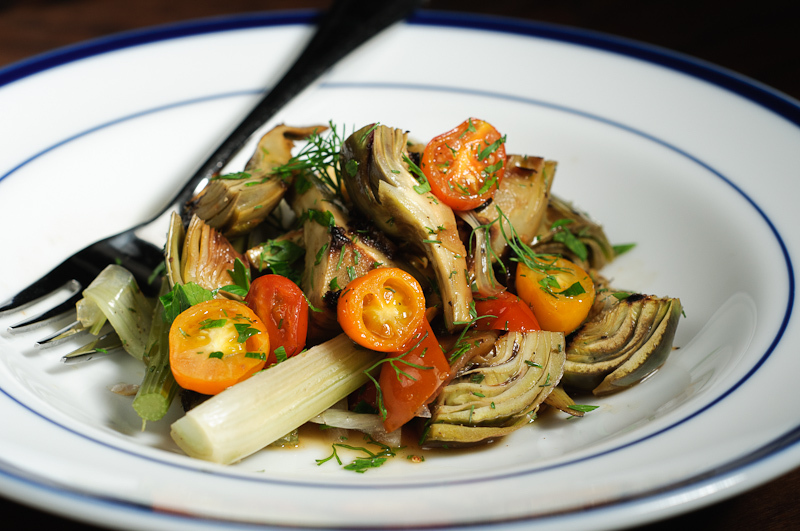 Baby artichokes love, love, love to be braised. It gives them the opportunity to develop multiple levels of flavor: the browned flavors from an initial sear, the mellow sweetness of the tender artichoke heart, and slow infusion with aromatics. 1. Fill a bowl with cold water. Squeeze one of the lemons into it and throw in the lemon halves. Prepare the artichokes quarters, throwing each one into the acidulated water right away to prevent browning. 2. Heat a medium-sized skillet over a medium-high flame. Add the olive oil, and a few seconds later, the garlic. Add the artichokes in a single layer and a big pinch of salt. Cook for about 5 minutes, turning once or twice to develop some browning on as many surfaces of the artichokes as possible. 3. Reduce heat the heat to medium low. Add the fennel, cherry tomatoes, rosemary, white wine, juice from the second lemon, and another pinch of salt. Cover. 4. When the artichokes are fully tender, probably about 15 minutes, remove the lid and raise the heat to cook off any excess water. Remove the rosemary sprig. Transfer to serving bowls and drizzle on the little bit of sauce remaining in the skillet. Garnish with black pepper, parsley, and the fennel greens.